Bonnie Bona, chair of the Ann Arbor planning commission, leads the commission through discussion of the 322 E. Kingsley property. On the map projected behind her, that's the light blue sliver to the east of the thick dashed line. The dashed line is the DDA boundary. At its Tuesday meeting, Ann Arbor’s planning commission voted to adopt a downtown plan that was different in significant ways from the one they’d previously adopted just three months ago. A small D2 (interface) in the South University area has been carved out, when none previously existed on the planning commission’s map. And a one-parcel-wide expansion of the D2 area has been undertaken to include a property owned by Zingerman’s Deli. Why was the commission considering the changes? Since the plan’s previous adoption, the city council had undertaken revisions to the proposed city zoning ordinances that had rendered the downtown plan inconsistent with those ordinances. 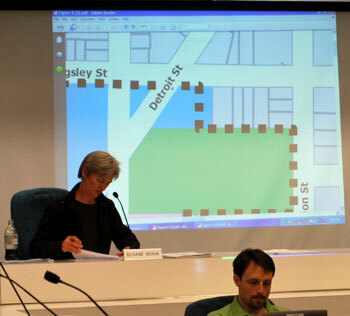 The planning commission’s action taken Tuesday night does bring its adopted downtown plan closer to consistency with the city council’s proposal for Ann Arbor’s new downtown zoning, but a significant incompatibility in the South University area remains. Before planning commission met, the revised downtown plan was scheduled to be presented for action by council at its June 15, 2009 meeting, with consideration of the final vote on the zoning package on July 6, 2009. Now that time frame could change, depending on the path taken by council. More on possible outcomes after the break. Planning commission was working from an affirmative resolution to adopt a downtown plan – changed in ways recommended by city staff – that conformed to the zoning changes made by city council at its April 6, 2009 meeting. The “amendments” referenced in the staff report reflect differences between planning commission’s originally adopted downtown plan and the downtown plan as it would need to be changed in order to be consistent with council’s zoning. [page 28] Incorporate recommended land use and urban design objectives, including the consideration of height limits, into overlay zoning districts for the review and approval of projects in the Core Areas. [page 53] Properties in the Downtown Interface district should have a minimum height of two stories and a maximum height of up to 6 stories. Placement standards should require a small amount of open space to be maintained and limit the building coverage to 70-80% of the lot. Additional building massing and setback requirements for Downtown Interface properties should be set by the character overlay districts. Revisions to two different maps were considered: (i) the future land use [core/interface], and (ii) base and overlay zoning map [D1/D2]. Three geographic areas were involved: East Huron Street, 322 E. Kingsley, and South University. Huron Street: For Huron Street, only the zoning map was at issue. City council had split the East Huron character area into East Huron 1 and East Huron 2. For the East Huron 1 area, which is the north side of Huron Street between North Thayer and Division, the building height limit is proposed by council to be 150 feet. That contrasts with the rest of the D1 areas, which have a height limit of 180 feet. The key point is that the council left the zoning as D1 in both of the Huron Street character areas. Because D1 zoning translates as “core” for the future land use map, that map – which doesn’t reflect character areas – didn’t require revision. The base and overlay zoning map reflects character areas, and thus needed revision. 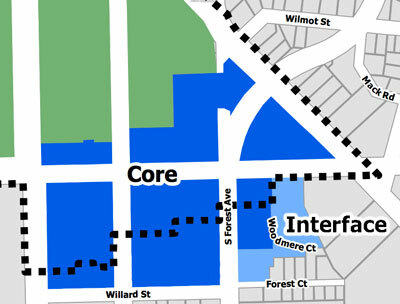 During the public hearing, some residents of Sloan Plaza and of One North Main weighed in for designation of that section of Huron Street as D2 – an interface zone that would limit the height of buildings to 60 feet. That would be a more dramatic height reduction than the East Huron 1 character district provides, which has a maximum of 150 feet – 30 feet reduced from the 180 foot maximum in other D1 areas. The planning commission spent little time deliberating on this particular issue, essentially agreeing with one representative of a property owner in the affected area, who spoke at the public hearing about the various compromises that had already been struck – no further compromise was required, he said. South University: Both maps came into play for the South University area. During the public hearing, planning commissioners heard arguments on both sides that will have been familiar to them from the years-long process that’s now drawing to a close. On the one side: residential areas need a buffer, don’t make South U. a “dumping ground for density.” On the other side: increased density is essential for economic sustainability, and a D2 zoning, with its 60-foot height limits, would amount to a “taking” of property value. Excerpt from the Downtown Plan Future Land Use Map as it would need to be drawn to be consistent with city council's proposed zoning at its April 6, 2009 meeting. This map was extracted from city documents. The heavy dashed line is the DDA boundary. Excerpt from the Downtown Plan Future Land Use Map as it would be drawn by planning commission at its May 19, 2009 meeting. This depiction of planning commission's map was drawn by The Chronicle – any errors are ours. The heavy dashed line is the DDA boundary. The vote was 5-2, with Bonnie Bona, Wendy Woods, Kirk Westphal, Tony Derezinski and Jean Carlberg voting for the re-introduction of the “core” designation for most of the area. Eric Mahler and Ethel Potts voted against that. [Evan Pratt and Craig Borum were absent.] Mahler said he found the claim of a “taking” to be “a little bit over the top,” and was concerned about designating areas as “core” that are outside the DDA area. On the prevailing side, Carlberg said that the area they were designating as “core” would be appropriate for high-density student developments. 322 E. Kingsley (Zingerman’s): At its April 16, 2009 meeting, city council changed the proposed zoning for the parcel at 322 E. Kingsley from R4C to D2. Zingerman’s Deli owns the parcel, located directly behind their operation at 422 Detroit St. Zingerman’s would like to incorporate the property (where there’s currently a fire-damaged building) into its operations, thereby removing some of the stress on its current buildings. Any rennovation to the 322 E. Kingsley property would be subject to review by the Historic District Commission, because it lies within the Old Fourth Ward historic district. During the public hearing, the planning commission heard from several speakers who objected to the assignment of the D2 designation to the property, on the grounds of “fairness” and “favoritism” – everyone loves Zingerman’s, themselves included, they said. But that didn’t translate into changing the zoning, just because Zingerman’s asked for it. They also heard from representatives of Zingmerman’s about why the D2 zoning was requested, as well as from a speaker who noted that he’d just witnessed two hours of “serious participation” by citizens who were engaged, and had been properly noticed, and concluded that the notion of fairness had not been violated. The vote on the commission was 4-3 for following council’s lead in assigning D2 zoning to the parcel. Voting for the D2 designation were: Eric Mahler, Tony Derezinski, Jean Carlberg, and Wendy Woods. Voting against it were: Bonnie Bona, Kirk Westphal, and Ethel Potts. Mahler, responding to an argument made by Peter Pollack at the previous week’s work session, said that the option of pursuing a PUD for a particular project (as an alternative to having the D2 zoning) would, in his opinion, be difficult. For a PUD, Mahler said, a public benefit would have to be demonstrated – and from what he could tell, the kind of project Zingerman’s was contemplating would most likely be for Zingerman’s benefit. Westphal did not cite “fairness” in voting against the D2 designation, but rather a respect for the long, extended process of community participation that had extended over a few years – none of which had included discussion of the 322 E. Kingsley parcel. Next Steps: The potential area of conflict between city council and planning commission has been reduced to the South University area. If on June 15, 2009, city council is presented with the downtown plan that’s been newly adopted by planning commission, and it chooses to adopt that plan, it will still need to contemplate changing the zoning proposal it considers on July 6. The current status of that zoning proposal is that it’s been approved on its first reading before council, with the reading on July 6 counting as the second and final reading. At that meeting, if council changes the zoning ordinance to match the downtown plan’s maps in the South University area, then the question becomes: Is that change substantial enough to require that the ordinance be given another first reading? That’s a question that will likely be put to assistant city attorney Kevin McDonald, who specializes in land use and planning matters. If council declines to adopt planning commission’s newly-revised downtown plan at the June 15 meeting, then the document would cycle back to planning commission for reconsideration. It’s possible that the A2D2 oversight committee – Marcia Higgins (city council), Roger Hewitt (DDA), and Evan Pratt (planning commission) – would provide some coordination between the two bodies so that an endless ping-ponging of the downtown plan would not result. Regarding the rezoning of 322 E. Kingsley, what is the definition of “proper notice” for citizens? I live three doors down from that property and have heard nothing about it. The Chronicle has been the only place I’ve read or heard anything. Proper notice for a public hearing on a master plan amendment is 1) a notice in the newspaper 15 days in advance of the meeting and 2) mailed notices to a list of groups required by statute (railroads, adjoining jurisdictions, county planning, etc.). On top of these requirements, the Planning & Development Unit also mails notices to registered neighborhood groups (like the Old Fourth Ward) and subscribers to the GovDelivery notice service approximately two weeks before the public hearing. For a rezoning that exceeds ten parcels, the statute requires a newspaper notice 15 days in advance. Beyond that, the Zoning Ordinance requires that owners and occupants of property being rezoned and properties within 300 feet of a rezoning receive a mailed notice in advance of the public hearing for the zoning (usually concurrent with second reading). (4) Public Hearing by City Council. (a) A public hearing shall be held by the Council before adoption of any proposed amendment to this Chapter. Notice of the public hearing shall be given by publishing said notice at least once in a newspaper of general circulation in the City of Ann Arbor, stating the time and place of such hearing and the substance of the proposed amendment. This notice shall appear in said newspaper at least 15 days prior to the date set for the public hearing. (b) Notice of the proposed zoning change shall also be made by the City Clerk mailing notification by first class mail to the person or firm to whom the property is assessed, and to all persons or firms to whom property within 300 feet are assessed, and insofar as is practically possible, to all occupants within 300 feet, provided, however, if the City can produce evidence that notice was mailed, failure of owners or occupants to receive such notices in any particular instances shall not invalidate any zoning ordinance enacted. So, Carl, on my reading of this, the downtown plan (a master plan amendment) considered by planning commission on Tuesday would not have required the notification of people within 300 feet — just the “general alert” specified above. For the rezoning, in the end a council issue, the timing of the mailed notification is keyed to the official public hearing on the zoning ordinance change, which for the A2D2 process has not yet been held (the session of city council held earlier in the spring devoted to public commentary on the subject was not the formal hearing) … that will come early July at the ordinance’s second reading. Dave, thanks for your follow-up. It would seem more logical to solicit the immediate neighbors opinions during these more formative phases rather than when the language is resolved and ready for votes. But I suppose you’ve got to draw the line somewhere. Fortunately in this case, it appears to be a fairly uncontroversial change. That property had been de facto Zingermans even before the fire, with the loading zone and sandwich lines creeping down Kingsley.